With the advent of Internet of Things (IoT) and connected devices, the number of data points has increased exponentially. The transmission of these heavy data sets (>100 Gigabyte) has been a significant challenge for the entire communication industry as the traditional methods involving copper wires have several limitations such as low bandwidth and high attenuation. These limitations led to the introduction of silicon photonics. Silicon photonics is a technology which uses silicon as an optical medium for data transmission. The technology is both cost- as well as energy-efficient and majorly helps in resolving the problems related to huge data transfer (>100 Gigabyte) and slow internet speed. Although silicon photonics technology is currently in its emergent stage, the roots of this technology can be tracked back in 1980s. Furthermore, the development of optical lasers, wavelength converters, and optical amplifiers has optimized the performance of silicon photonics technology over the years. The problem to transfer huge amount of data could be resolved through high density photonics integration with photonics devices. Moreover, these integrated photonics devices work closely with energy-efficient network operation. Silicon photonics is the perfect solution for such high-density photonics integration, allowing the incorporation of photonics devices (made from silicon) on a silicon wafer. Silicon material is translucent and has a refractive index in the telecommunication wavelength range of 1200nm-1700nm. Thus, it is used to build dense photonics devices and perform functions such as optical modulation. The factors driving the growth of the global silicon photonics devices market include efficient power consumption using silicon photonics devices, funding landscape of the silicon photonics devices market, and increasing bandwidth requirement for large data transfer. As the price of silicon photonics technology is showing a constant downfall, its demand has been extensively increasing in several verticals including healthcare, telecommunication, and defense, among others. Moreover, with the rising awareness in healthcare, various technological advancements, such as lab-on-chip solutions and refractive sensing, among others, have already been initiated which are expected to increase the demand for silicon photonics technology in healthcare and consumer application segments. The need for advanced data transmission technologies is driving the silicon photonics devices market. With the integration of silicon-based chips, it has been easier to transfer huge amount of data (>100 GB) even from long distances because of the strong signal strength. IBM Corporation provides silicon photonics chips that are capable of combining four wavelengths, thereby allowing the chips to transmit four times data per fiber. The silicon photonics chips allow transmission and reception of data at 25 GB/s, thus providing an aggregate bandwidth of 100 GB/s. The need for increasing the bandwidth continues to grow hand-in-hand with the data bandwidth allotted to mobile users, which increases the number of individual cells required to support the data traffic. As the demand for bandwidth increases in applications such as data centers, the industry would be shifting toward vertical integration in order to enhance the manufacturing process. The demand for silicon photonics-based solutions vary according to various geographical regions. The silicon photonics devices market holds a prominent share in various countries of North America, Asia-Pacific (APAC), Europe, and Rest-of-the-World (RoW). Geographically, in 2017, North America dominated the global market for silicon photonics devices in terms of value and is expected to witness robust growth during the forecast period (2018-2024). The dominance of North America region is attributable to the rising adoption of silicon photonic products due to features such as low power consumption and high efficiency. Over the years, other than launching new products, leading market players including Intel Corporation, Cisco Systems, Inc., and Juniper Networks, Inc., among others have entered into partnerships and collaborations to increase and expand their presence in the silicon photonics devices market. Furthermore, players in the global silicon photonics devices market have also invested in R&D for the advancement of silicon photonics technology. For instance, in 2017, IBM Corporation invested 5-7% of the total R&D expenditure toward the development of silicon photonics segment. Some of the key players in the global silicon photonics devices market include Luxtera, Intel Corporation, Cisco Systems Ltd., and Acacia Communications Inc., among others. The report is a compilation of different segments of global market for silicon photonics devices including market breakdown by product, component, region, and application. The report further takes into consideration market dynamics and competitive landscape. The report also discusses in detail about the key participants involved in the industry. • What will be the global silicon photonics devices market size in terms of revenue from 2017-2024? • Which type of product acquired the major market value in the global silicon photonics devices market in 2017? • How much revenue will be generated by the different products, components, and application vertical of the global silicon photonics devices market during the forecast period? • How much revenue will be generated by different products across different application verticals in the global silicon photonics devices market during the forecast period? • Which market player acquired the major market share in the global silicon photonics devices market in 2017? • What are the driving factors for the global silicon photonics devices market from 2017 to 2024? • Which factors are impending the growth of the global silicon photonics devices market? • What are the recent trends and developments in the global silicon photonics devices market? 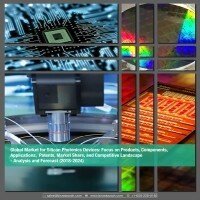 • Which region will lead the global silicon photonics devices market in 2024? 8.6 Hamamatsu Photonics K. K.
8.7 Huawei Technologies Co., Ltd.
Table 7.3 Some of the Largest Data Centers in the U.S.
With the advent of the Internet of Things (IoT) and connected devices, the number of data points has increased exponentially. The transmission of these heavy data sets (>100 Gigabyte) has been a significant challenge for the entire communication industry as the traditional methods involving copper wires have several limitations such as low bandwidth and high attenuation. These limitations led to the introduction of silicon photonics. Silicon photonics is a technology which uses silicon as an optical medium for data transmission. The technology is both costs as well as energy efficient and majorly helps in resolving the problems related to huge data transfer (>100 Gigabyte) and slow internet speed. Although silicon photonics technology is currently in its emergent stage, the roots of this technology can be trace back to the 1980s. Furthermore, the development of optical lasers, wavelength converters, and optical amplifiers has optimized the performance of silicon photonics technology over the years. The factors driving the growth of the global market for silicon photonics devices include efficient power consumption employing silicon photonics devices, funding landscape of the silicon photonics devices market, and increasing bandwidth requirement for large data transfer. As the price of silicon photonics technology is showing a constant downfall, its demand has been extensively increasing in several verticals including healthcare, telecommunication, and defense, among others. However, even with such enormous growth, the global market for silicon photonics devices is facing immense challenges which include issues in adopting different communication systems, the risk of thermal effects, and lack of commercialization in the telecommunication sector. The rapid adoption of internet and mobiles is the major opportunity that silicon photonics devices market is lined up with in coming future. Several economies, such as the U.S. and China, are heading up toward initiating upcoming projects on smart cities. Moreover, with the rising awareness on health, various technological advancements, such as lab-on-chip solutions and refractive sensing, among others, have already been initiated in the healthcare sector, increasing the demand for silicon photonics technology in healthcare and consumer application segments. The global market for silicon photonics devices has been tracked along the lines of its products, components, application areas, and geography. Revenue generated from various application areas, namely data communication, telecommunication, healthcare, consumer electronics, and defense, have been analyzed. The report also covers the market for silicon photonics devices on a global scale and consequently provides revenue data for the key regions. A separate segment has been made for the key global regions: North America, Europe, Asia-Pacific (APAC), and Rest-of-the-World (RoW). The products that have been prevalent in the silicon photonics devices market include transceivers, optical cables, Radio Frequency (RF) circuits, multiplexers, and attenuators. In 2017, transceivers generated the maximum revenue, which was attributed to the increasing demand of transceivers from the data communications and telecommunications industry. The global market for silicon photonics devices (based on components) can be categorized into optical waveguides, an optical modulator, a photo detector, optical switches, and lasers. In 2017, optical waveguides generated the maximum revenue, primarily driven by the declining cost of optical waveguides and the increasing usage of optical waveguides in the data transfer applications. The global market for silicon photonics devices (based on application types) can be categorized into data communication, telecommunication, healthcare, defense, and consumer electronics. Data communication application segment is expected to dominate the market in the forecast period (2018-2024) because of the rising application of silicon photonics devices in high-performance computers and data center applications. Owing to the cost-effectiveness and reliability for commercial applications, silicon photonics devices are preferred. Furthermore, data communication is expected to be the fastest growing application in the global silicon photonics devices market as the photonics protocol is providing services that would surpass optical and copper technologies. In 2017, North America dominated the global market for silicon photonics devices and is expected to witness a strong growth rate during the forecast period. The dominance of North America region is attributable to the increasing adoption of silicon photonic products due to features such as low power consumption and high efficiency. Over the years, other than launching new products, leading market players including Intel Corporation, Cisco Systems, Inc., and Juniper Networks, Inc., among others have entered into partnerships and collaborations in order to increase and expand their presence in the silicon photonics devices market. Furthermore, players in the global silicon photonics devices market have also invested in R&D for the advancement of silicon photonics technology. For instance, in 2017, IBM Corporation invested 5-7% of the total R&D expenditure toward the development of silicon photonics segment. Some of the key players in the global market for silicon photonics devices include Luxtera, Intel Corporation, Cisco Systems Ltd., and Acacia Communications Inc., among others.